MALACCA: The state’s tourism industry will get a boost following plans by Arab investors to pump in more than more RM1bil in investment to develop several tourist-related projects over the next three years. Chief Minister Datuk Seri Mohd Ali Rustam said the investments were to develop two Arab City projects on Pulau Melaka and Klebang. Middle Eastern lure: Mohd Ali and Salleh Hadi Al Mansor, president of Golden Corporate Heritage, exchanging documents at the Arab City project groundbreaking ceremony in Malacca yesterday. The project on Pulau Melaka covers about 1.7ha and involves about RM400mil while the Klebang one, which covers an area of about 4ha, would see an investment of RM700mil, he told reporters after opening the Arab City project on Pulau Melaka here yesterday. He said the projects would allow the state to better attract Middle Eastern tourists and give locals a chance to experience Arabic culture. The Arab investors, Golden Corporate Heritage (CGH), will carry out joint projects with the state-owned Chief Minister Incorporated (CMI). Arab City on Pulau Melaka involves the development of a three-storey shopping complex including an Arabian bazaar, Middle Eastern restaurants and cafes and a unisex Arabic health and beauty spa. The Klebang project involves the construction of a five-star hotel, a water theme park, an aquarium and a floating restaurant. GCH managing director Hesham Eldin Fath Mohamed Khalil said the company was also looking at developing an Arab Village in Kampung Jawa. 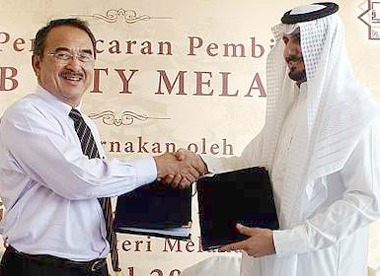 Arab City on Pulau Melaka is expected to be completed by the end of next year and the one in Klebang in 2012.